A “big step” or a just step? My last post considered the overwhelming view of Harris and Lewis crofters that the Convener of the Crofting Commission, Colin Kennedy, must go given his role in the alleged abuse of power within the Crofting Commission dubbed ‘The Common Clearances‘. But despite many calls over several weeks for him to consider his position there is no sign of him stepping down anytime soon. In the absence of him doing the right thing is it time for the Scottish Ministers to force his hand? 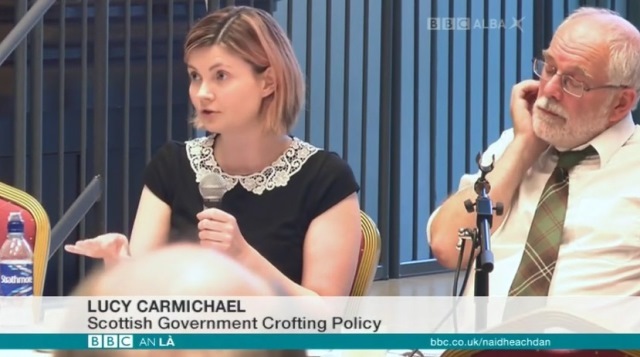 Ms Carmichael explained that the way crofting legislation is framed the only recourse available to crofters is to mount a challenge in the land court. 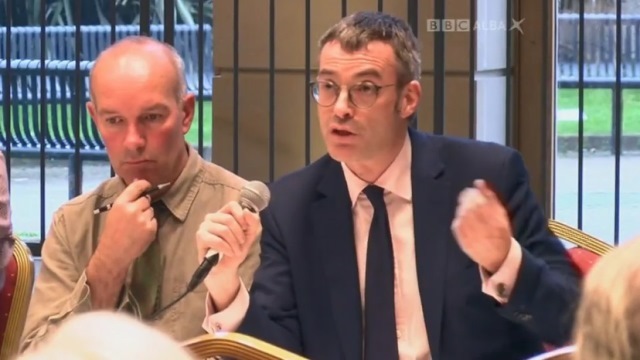 However, that was fiercely disputed by Mr Inkster who said that as the commission is a statutory body under the control of the Scottish Government it was perfectly legitimate for ministers to intervene if they felt it appropriate. But Ms Carmichael felt that would be a “big step” – a statement which drew a sharp intake of breath from the audience, particularly those in Upper Coll who felt their removal from office was equally a big step and, indeed, unconstitutional. Mr Inkster said that the commission had knowingly gone against their own legal advice, changed the guidance to common grazings committees and misinterpreted crofting legislation. “It is hard to see under such circumstances that anyone can have any confidence in any new guidance given out by the commission,” he said. I would point out, if I recall correctly, that Lucy Carmichael also made reference to the Scottish Public Services Ombudsman and the Commissioner for Ethical Standards in Public Life in Scotland as other possible routes of recourse that crofters could take in addition to or instead of action via the Scottish Land Court. I would strongly suggest therefore that the Crofting Commission should, in all the circumstances, review this extraordinary decision. If they fail to do so the Scottish Government should maybe question the behaviour involved and perhaps even consider removing the commissioners responsible as “unsuitable to continue” as members. A power that the Scottish Ministers have at their disposal under the Crofters (Scotland) Act 1993. That may be seen by many as a more reasonable and justified use of power than that employed by the Crofting Commission. 46 blog posts on the common grazings debacle later and I am firmly of the view that it would indeed be a more reasonable and justified use of power than that employed by the Crofting Commission. The evidence is now clear. The Crofting Commission have been exposed to knowingly acting illegally, clearly acting illogically, operating like a kangaroo court, creating conflicts of interest, brazenly deleting its own history and attempting to deny that history. They have been party to intimidation and bullying, obfuscation and manipulation, controlling grazings constables, flouting the will of Parliament and ignoring the law/lawyers. But ultimately they have made a massive U-turn which is nothing more than a clear admission that they got it wrong. They have cost the public purse a huge amount of money. It is, in light of all of this, not a “big step” to remove a commissioner. It is an obvious step and a just one. This entry was posted in Common Grazings, Crofting Commission and tagged abuse of power, big step, Brian Inkster, Colin Kennedy, Commissioner for Ethical Standards in Public Life in Scotland, Common Clearances, common grazings debacle, Convener of Crofting Commission, Crofters (Scotland) Act 1993, Crofting Commission, Crofting Commissioners, crofting policy, crofting policy officer, Harris, Isle of Lewis, Lewis, Lucy Carmichael, Scottish Government, Scottish Land Court, Scottish Ministers, Scottish Public Services Ombudsman, Stornoway, Upper Coll, Upper Coll Common Grazings, Upper Coll Common Grazings Committee, West Highland Free Press, WHFP on August 14, 2016 by Brian Inkster. The Scottish Crofting Federation (SCF) has organised a meeting in Lewis this Wednesday, 3 August 2016. 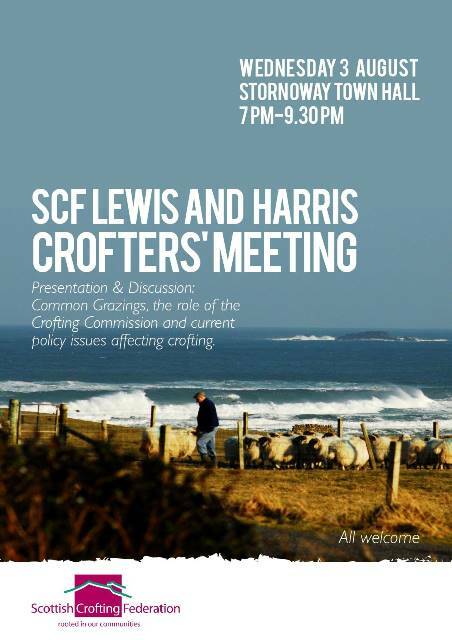 It is at the Stornoway Town Hall at 7.00pm and will involve presentations and discussions on Common Grazings, the role of the Crofting Commission and current policy issues affecting crofting. You don’t have to be a SCF member to attend and all are welcome. The meeting will be chaired by Donald Macsween – Lewis crofter, SCF member and activist. A lively discussion is expected given the recent controversy surrounding alleged abuse of power within the Crofting Commission arising from what this blog has dubbed ‘The Common Clearances‘. Recent revelations have shown that the Crofting Commission knowingly acted contrary to their own policies, procedures and legal advice. All this and more will be up for debate on Wednesday night in Stornoway. This entry was posted in Common Grazings, Crofting Commission and tagged abuse of power, Brendan O'Hanrahan, Brian Inkster, Chief Executive of Scottish Crofting Federation, Common Clearances, Common Grazings, Crofting Commission, crofting lawyer, Donald Macsween, Harris, Inksters, Isle of Lewis, Lewis, Lucy Carmichael, Patrick Krause, policies and procedures, Russell Smith, Scottish Crofting Federation, Scottish Government, Stornoway on August 1, 2016 by Brian Inkster.